"Loevinger's Stages of Ego Development"
I thought I'd bring this up over here. Here's a developmental model that was developed by psychologist Jane Loevinger. I added the SD colors for comparison purposes. This model is more of a purely psychological model then Spiral Dynamics which is psycho/social. "Nice to Me" or "Mean to Me"
These are the three "conventional" stages in Jane Loevinger's model of development. These are the three stages that most adults in the western world have developed to. Someone at the Conformist Stage or below may be able to cognitively understand what Deism is but IMO, in order for a person to truly "get" Deism they need to have developed to at least a "Self-Aware" stage. In normal development, at school age or somewhere in the school years, the child negotiates the transition from the egocentric Self-protective stage to the group-centered Conformist stage. More psychologists and philosophers have described Conformity than any other stage. At this stage, the child identifies self with the group or its authority--be it parents, teachers, or peers. Rules are accepted just because they are the rules. This is the period of greatest cognitive simplicity: There is a right way and a wrong way, and it is the same for everyone all the time, or at least for broad classes of people described in demographic terms. What is conventional and socially approved is right. That is usually true with respect to conventional gender roles. However, a person who rigidly conforms to some unconventional gender norms is still a Conformist. Friendliness and social niceness are highly valued; disapproval is a potent sanction. The person is preoccupied with appearance, material things, reputation, and social acceptance and belonging. Inner states are perceived in the simplest language (sad, happy, glad, angry, love, and understanding), contrasting with an almost physical version of inner life at lower levels (sick, upset, mad, excited) and a richly differentiated inner life at higher levels. People, including the self, are perceived in terms of stereotypes based on social groups rather than in terms of individual differences. The way people are and the way they ought to be are not sharply differentiated. People at this stage usually describe themselves and others of their in-group in socially acceptable terms. Interpersonal interaction is seen primarily in terms of actions, not feelings, and the prototypic action is talking. Group pressure can presumably encourage transition from the Self-protective to the Conformist stage. But what impels the transition out of pure conformity? Possibly, the young person during the primary school and secondary school years finds him or herself a member of different groups that demand conformity to somewhat disparate standards. One woman, for example, said that her mother punished her for some infraction by forbidding her to go to mass. She feared punishment in the Hereafter, but her mother was the clear and present danger. An individual can hardly endure such a dilemma without abandoning his or her absolute faith in at least one of the competing authorities. By whatever means, the person at the Self-aware stage has become aware that not everyone, including his or her own self, conforms perfectly all the time to the characteristics that stereotypes seem to demand. Once "what I am" is untied from "what I ought to be," the way is open to begin examination of self. The ability to conceptualize inner life expands; interpersonal relationships are described not merely as actions but also in terms of feelings. In many people at this stage, there is an acute sense of the distinction between self and group; emotions such as self-consciousness and loneliness are described. At the same time, the person perceives that there may be alternative possibilities in many situations that for the Conformist are covered by absolute rules or statements. Qualifications and contingencies are allowed, although they still tend to be stated in broadly demographic terms rather than in terms of individual differences: For example, some activity is okay if you are an adult, or if you are a boy, rather than if you are personally qualified or have a deep desire for it. Such modification of absolute rules may apply to anything from sexual mores to a woman having a career. The Self-aware stage is still basically a version of Conformity. Growth to the Conscientious stage is another major and mysterious shift, for, as Freud ( 1930/1961) pointed out, so long as sanctions for misdeeds come from outside oneself, they can be escaped, but a bad conscience is ineluctable punishment. How are people induced to make that shift? The psychoanalytic answer is by identification with others admired, loved, or even feared; the social learning answer is that in the long run a person without conscience is punished or socially disapproved. The social learning answer seems more adequate to account for growth to Conformity than to growth past that stage, and intuitively conscience seems to be less calculating than is implied by social learning theory. However, research has no clear answers. The distinctive mark of the Conscientious stage is self-evaluated standards: I approve or disapprove of a given conduct not just because my family or my schoolmates or the authorities do, but because that is what I personally feel. Of course, most people at this level do choose to adopt conformity as an everyday rule, so the difference between this stage and the Conformist and Self-aware stages is not the behavior itself. At this stage, one is guilty not primarily, or not only, when one has broken a rule, but rather when one has hurt another person. Motives and consequences are more important than rules per se; ought is differentiated from is. Inner states and individual differences are described in vivid and differentiated terms. Long-term goals and ideals are characteristic. The Conscientious person is reflective; self and others are described in terms of reflexive traits. The only reflexive traits that regularly appear at a lower level are self-consciousness and self-confidence. The Conscientious person is self-critical but not totally rejecting of self, as are some persons at the lowest levels (as well as depressed people of any level). The recognition of multiple possibilities in situations leads to a sense of choice; decisions are made for reasons. The person strives for goals, tries to live up to ideals, and to improve the self. The moral imperative remains, but it is not just a matter of doing right and avoiding wrong; priorities and appropriateness are considered. Moral issues are separated from conventional rules and from esthetic standards or preferences. To make such distinctions entails greater conceptual complexity than at the Conformist level or lower. Achievement is highly valued, not only in terms of competition or social approval (which always retain some importance), but in terms of one's own standards. Work, rather than being purely onerous, is an opportunity for achievement, so long as it is not dull or boring. People at this level are more likely than those at lower levels to think beyond their own personal concerns to those of society. The conscientious character has the negative aspect that the person may feel excessive responsibility for others. IMO mythic religion is just a cultural meme* that attaches itself to a certain level of conscious development. This level of development evolved in humans as a way of dealing with certain existential living conditions (agrarianism amongst others factors). Under those specific conditions the "mythic" mindset works very well, however when applied in a modern environment it tends to be highly lacking hence the evolution of the "modern" mindset. This modern world would not be possible however if it weren't for the stability that the "mythic" level of consciousness provided in the first place. I don't agree with the idea of memes; to me they are just unnecessary details and pseudo application of biology to psychology--thanks to Richard Dawkins no less. I don't really want to get into meme theory right now but I do feel that the term does have some value as long as it's used in the proper context. I further disagree that the "mythic" mindset was more suitable for a certain type of world--i.e. agrarian premodern. Remember that 2nd person "mythic" reasoning is an evolutionary step ahead of the 1st person "animistic" reasoning that proceeded it. Agrarian life requires permanent settlements. In order to settle permanently and in close proximity with others one needs stability and the ability to stay on task. (Farm work can be pretty monotonous afterall.) This sort of stability isn't possible at the earlier "tribalistic" and "feudalistic" stages of development. Therefore the 2nd person "mythic"/Conformist mindset co-evolved with agrarianism. The fact is that the mythic folks are doing very well within the modern world--just look at United States. Much of the U.S. especially the deep south and midwest is still an agrarian based culture. It's no coincidence that this area is also called "the bible belt". ...or for that matter the upcomming India and China--just about anywhere in the world, the mythic mindset is far more effective at controlling and gaining success. India and especially China are still largely pre-modern based cultures that are just moving into their respective industrial revolutions. It's true that the conformist/mythic mindset serves a very useful purpose in early industrial cultures. It provides for a very large population of manual laborers that are just off the farm and who are willing to do what they are told as well as middle management that is willing to act as dictatorial authorities. In order to manage such a system one still needs at least early modernist thinkers however. The dominant mythic culture of Europe nowadays is eco-sophic, gaia-philic, deep ecology based. Yes both myth and rationality exist at all levels of development. Furthermore, the rational mind as it first appeared, prominently, in Greece was when Greece was an agrarian society. Now it is true that the reason Greeks were the first to mass produce reason, was due to "trade," and yet, all that it shows is that the only requisite for the emergence of a rational mindset is an inquisitive pesonality that happens to first arise among merchants who had to prepare themselves agaisnt elements of nature and be appreciative of differnent cultures. That is, merchants, inorder to be succesful, had to become consistent in their use of rationality (which does not mean that they were anything like the philosophers, merely that when a society becomes based upon trade, it invariably ends up producing men who'll begin to rationally scrutinize the laws of nature and human nature). Yes, what happened was the development of the ability to take a 3rd person, multiplistic, objective based perspective. Neither the Greeks nor the Romans ever reached a fully "Modernist" stage of development with perhaps the exception of a select few sages and philosophers. The fact of the matter is that a "rational" mind-set has no survival advantages over the so called "mythic-mindset." Sure it does. That's why the Army has enlisted and officer ranks. The enlisted are the backbone of a tradional army because they are "mythic/conformist minded" and will do what ever they are told while the officers need to be mutiplistic and objectively minded. Modernity couldn't have come into existence without the development of the 3rd person, objective mindset. Yes they are, but their reasoning tends to be limited to a 2nd person perspective. In other words they tend to subjectify the outside world. That's why god takes on personal "thou" qualities at this level of reasoning. ...the only difference is that they are not consistently/methodologically rational. And so the real dispute is about intellectual honesty. No the real issue is about development. How do we get people living in the modern world to develop spiritually beyond a "mythic" mindset? As Thomas Paine said it in the Age of Reason, the most corrupt person is a priest who begins with telling a lie to himself, by professing to believe what he cannot believe to be true. Mythic folks are just as capable (and have been for several thousands of years back in prehistory) of believing in reason based reality, the fact that they don't is partly due to inertia and partly ignorance. I mainly agree although I don't think Paine had any clue about stages of development in adulthood. If he had, perhaps he would have toned down his rhetoric regarding mythic religion a bit. Disclaimer: This is a glimpse into my system of philosophy that I've developed after much research and analysis, and at considerable financial and filial costs; ergo, I post this over here under the stipulation that all mention of ideas uniquely presented here would be referenced to the source, which is this article. I do not necessarily disagree with the developmental psychology of Loevinger in its broad stroke of pre-conventional, conventional, and post-conventional stages. However, I contend that these psychological developments are reached by all human beings by the age of 21—there is observational data to corroborate that the grey matter in the cerebrum of young adults reaches maturity around that age. Once the age of maturity has been reached, the objective hierarchy (pertinent to the neurological development of the human mind/brain) ceases its linear progression. After that age, all development is merely horizontal, and thus subjective. By that I mean that, and in Freudian terms, once the id (it), ego (me), and the superego (we) parts of the psyche have fully developed (corresponding to Piaget’s sensory-motor/operational, concrete operational, and formal operational stages, respectively), and almost all humans go through this universal development, the linear progression of psychic development, in my opinion, ceases. Afterwards, in my opinion, at the formal operational level of cognitive development all human beings are perfectly rational—or capable of non-mythic rational morality and perspectives. Now, what seems to happen at this level of formal operation, or what would roughly conform to Loevinger’s post-conventional stage, is that most of rationality is fragmented; that is, it is not based upon what I call “systemic subjectivism.” You can say that at the rational level, at which all adult and sane human beings are, what we get are three different kinds of rational orders, which correspond to various ideologies (call them memes, if you like) that seem to progress in their own linear directions away from a systematic understanding of the whole system (call it a holon, if you will). 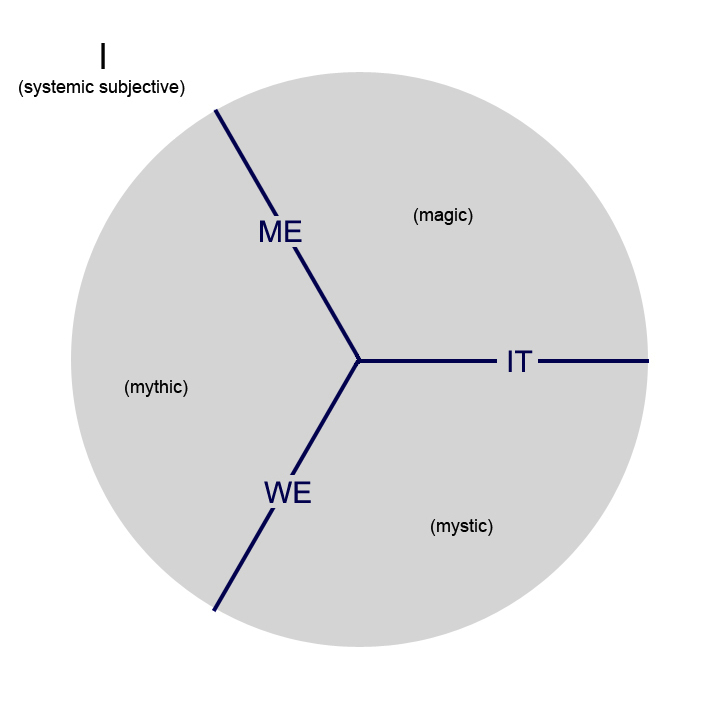 The “Me & We” is another fragmented reality produced this time by the mythical mindset. Here there isn’t much awareness of the objective world; instead the focus is always upon the community viz. a viz. a charismatic savior. The ontological premises of this mentality are essentially the same as that of “existentialism.” Both are based upon an “occasionalist” a-causal view of reality—and it is no surprise that existentialist (and its derivative ideologies), of the likes of Kierkegaard (a Christian) or Sartre (an atheist), profess extreme moral relativism and ontological skepticism on rational grounds. In Islam, the death of reason and philosophy came by precisely through the dominance of Ghazali: The champion of mythic Sunnism and mystic Sufism. It was the triumph of Occasionalism of Asharite theologians over the Rationalist/Schizmatic Mu’tazilah, in matters of theology, that eventually lead to the complete overthrow of philosophy a couple of centuries later. Although, to be perfectly honest, the Eastern Muslim Philosopher (vs. the Western Andalusian counterparts among whom was the great Ibn Rushd) were strictly speaking Neo-Platonists, and that their rationality too was fragmented, but not in the way of mythos. 1. AQAL requires methodological Individualism (or what I call systemic subjectivism) if it truly wants to produce a choice that is simply not in the “We & It” flatland. 2. Mysticism—and its pretension to grasp the nomina, or Kantian “things in themselves,” and thereby postulating the identity of the Self and Absolute, Immanent and Transcendent, Atman and Brahman—as articulated by Hegelian dialectics is simply unfounded upon epistemic basis. The dogma that Hegel propounds, but is unable to defend, is that the nature of thought (our internal cognitive categories) is identical with the nature of reality. [In the Matrix Revolutions an Indian "program/er" gives us a crash insight into the Hindu mindset of strict determinist causality void of all voilition--which is also what the machine world was built on--and which is what we have in Hegel and Marx's dialectical & hierarchic approach to history]. Wilber astutely recognizes that this claim cannot be defended strictly on a rational basis—although neither Hegel, Fichte, nor Schelling were mystics in the genuine sense—and so he tries to defend it upon pseudo empirical bases of “verification within the community of peers”—as if a few dunces could gather together and conjure up reality out of the figments of their imaginations—utterly oblivious to the neo-empirical Kantian-Popperian precepts of falsification and reductionism. That is, human knowledge advances not just in a blind inductive/verifiable way, but theories are developed deductively and then we try to fit them to the evidence—not try to fit the evidence around them. And reductionism states that all phenomenon can be traced back to its component parts, in which case, and given that Integralism/Hegelianism/Communism are all non-falsifiable, all that mystical experiences mean, so far, is that through certain processes certain portions of the brain are activated that produce certain illusions that are then projected by the mystics over the objective reality—when reality, or nomina, exists independent of our phenomenal cognition (which goes back to the earlier premises of Kant that were never refute by Hegel). Both Hinduism and neo-Confusionism (which incorporates Confucianism with Taoism and Buddhism) are non-Western forms of Mystical flatlands. They are also based upon a holistic view of the community synthesized with the external world; in other words, in this milieu of conjunctive and objective, there is no room for subjective. One can see this best in the popularity of Advaita Vedanta (non-dual monism) among the Western mytics and their secular westernized Indian counterparts, instead of the Dvaita Vedanta (dual monism), or Vis(h)is(h) Advaita Vedanta (quanlified non-dual monism). Systemic Deism (my religion/philosophy) is closest to Visis Advaita, if only because that is the viewpoint closest to Kant’s critical philosophy and his concept of Antinomies that cannot be believed in with certainty, but it makes sense to believe in them due to moral necessities—the existence of God, world, and soul—I’d say that I take their existence axiomatically a-priori. I’d like to point out that I’m not strictly a monist, but then I would think that the concept of qualified non-dual monism is not strictly monism either. In contrast to the non-dual monist, who are better called Absolutists—as indeed all German idealism is called Absolute Idealism—the qualified non-dualists ought to be called Transcendentalist. Incidentally, that corresponds to Kant’s Transcendental Idealism. Reverting to the main thrust of your argument, I’d say that once human beings had developed fully modern brains (Cro Magnon), once language was adequately developed, and once writing developed that could adequately store and thus improve upon the preexistent thought, the notion of a fully integrated rational man had become a possibility. The reason I deny any linear hierarchic rigidity to the memetic schemes of Spiral Dynamics is partly because of their Hegelian premise, which are clearly false, but more to the point that they are based upon a false imposition of the objective heirarchic psychological/physiological determinist development over the subjective ego that comes of age only after this developmental process, and does not continue up the ladder indefinitely--it's development is terminal, and afterwards, there are merely preferences of states, not development of stages. If we can take my modification of Piaget’s developmental stages (he has four, I add another one) then human hierarchic development ends as follows: Sensor-motor (it), Pre operational (me), Concrete Operational (we), Formal Operational (the three flatland scenarios as presented above, instead of the linear development), and Tran-Formal Operational (I) . Piaget says that in some cultures folks do not reach the Form-Op stage, with which I disagree. The fact that they stick with emphasis upon community, does not mean that they are not capable of individuation; it just means that within the stage of Form-Op they usually end up choosing a flatland, and almost all the folks in the world are either in one or the other of the three dimensions. This is the fifth category, and it is important that we appreciate that this is not a “stage” of development. It is merely looking at the whole Form-Op from a systematic subjectivist point of view—hence my designation of it as systemic subjectivism. The idea of systemic subjectivism is to start from the most logical point of view: Our Rational Self—or as Descartes would say that my thought gives me the certainty to believe that I exist. Now, from here on, the systemic subjectivism resembles Integral AQAL, except in the very first detail: Systemic Subjectivism is based upon methodological Individualism, which means that it does not synthesize all conflicting ideologies (yin/yang) in a dialectical fashion; instead it rejects ideas that are incompatible with the view of an individual simultaneously as a subject, object, and part of the inter-subjective community. In other words: there is no “transcending” of oppositions but a systematic/reductionist construction of a model of reality based upon the premises that only individual/s exists, there is an external reality that we come to experience as causal phenomenon, and that the ultimate reality, or nomina, is essentially transcendent. I think that it can be satisfactorily shown that by 500 BCE, human civilizations had sufficiently developed a cultural where discursive thought and written language was well established, and thus our formal-operational psyche came into being as the final stage of human evolution. Over here I’d reference the work of Julian Jaynes’ “Origin of Consciousness in the Breakdown of the Bicameral Mind.” I read that book back in 2003, and I must say that my spiritual journey towards enlightenment began with that book, prior to which I merely a dogmatic apologist masquerading as a rationalist. Until then, humans were not “conscious” in our sense of the word. They had no idea of “subjectivity.” In fact their world/brain was divided into the god and man portion—which is ripe for the concrete operational mentality—and under such a mindset that we had the development of the first mythic-mystic civilizations of the world, out from our animist/magic ancestral mindset. However, with the development of writing, as a repository for complex thought—with a simultaneous development of commodity “money” that fostered trade—we had the final change in the psyche of human beings: the dawn of the first rational man—the formal operational mentality. I’m afraid that I cannot further develop this topic without adding a couple of extra pages to the present four pages of single type. However, I’m obliged to say that the biggest problem with Jayne’s theory is that it is unverifiable—albeit, I think there is sufficient anthropological evidence (both linguistic and forensic) to give credence to the claim that both Piaget’s form-op and Loevinger’s post-conventional stage of development came about quite recently in the history of humanity: The birth of civilization (circa 5000-10000 BCE) was the fruition of concrete operational or conventional stage; and the birth of letters and trade (circa 500-1000 BCE) lead to formal operational or post-conventional stage of human development. However, once the form-op/rational man emerged on stage, the trans-formal operational mentality was also in his grasp. The reason why so few have grasped it, either then or now is due to intrinsic human naivety and inertia. Some of the men who were at this level are Socrates, Aristotle, Smith, Jefferson, Paine, Hume, Kant, Mises, Hayek, Voltaire—you know the wrap…. Hello Averroes. To start with your essay has certainly gone beyond the scope of this thread. To answer it correctly it should really be split off into three or four seperate threads which I don't have the time for right now. I will say that I agree with many of the ideas that you've presented here but I also very much disagree with many of the ideas as well. For instance Piaget’s stages are absolutely developmental which means they develop in a sequence. His theories have now been backed up empirically, and although the details of the work in this area are far from complete, one thing that has shown up again and again in the data is linear development. This isn't just a philosophical hypothesis anymore (as with Hegel). At this point, this a well tested and empirically researched scientific theory. I'll have to revisit more of the details of the argument a little later when I have more time. Piaget’s stages are absolutely developmental which means they develop in a sequence. His theories have now been backed up empirically, and although the details of the work in this area is far from complete, one thing that has shown up again and again in the data is linear development. This isn't just a philosophical hypothesis anymore (as with Hegel). At this point, this a well tested and empirically researched scientific theory. Yes, I agree with you on that. My point is that Piaget's hierarchic development is approached by all human beings by the age of 15-21, in all parts of the world, today. However, once these stages are rapidly covered by us, as a species, then we can no longer use them to justify a continuous climb up the ladder, as is done in Spiral Dynamics, where it is presumed, in a classic dialectical fashion, that individuals cannot skip a stage of development (which have nothing to do with the development of our psyche, to the extent that the SD stages are experienced by adult human beings with fully functioning brains and mature minds). This is like the fallacious argument of Marx that stated that given the history's dialectical march towards progress, the first country to socialize/communize itself would be Germany (the most technologically advanced capitalist economy of Europe) and the last would be Russia. Note that I'm not disputing that humans, from infancy to adolescence, must go through strict developmental stages. That cannot be denied. What I'm saying is that after the form-op stage is reached, it is my belief that the rest of human psychological "development" (using that word with strict reservations) is no longer dialectical-vertical, but horizonal; which means that in my opinion, the scheme of civilization/cultural/personal development as presented in SD is not hierarchic at all--at least not after the purple level, which roughly coincides with the con-op stage in almost all anatomically modern human beings, today. Today, when people are at one level of consciouness/civilization, they can skip a "stage," which is only possible if these differences among us are simply not hierarchially determinate. After maturity of human brain, and stepping aside the technological advacements that progressively shrink distances and brings more and more people into each others awareness (today's global village), we can see that the world ideas can be generally divideded into three seperate quadrants, as I've explained previously, and that an ordinary human being is usually jumping around all three quandrants, because his reality is fragmented. Consider Bill Clinton, a politician that I generally like. He, like all of his kind, has a narcissistic personality (as indeed almost all politicians, actors/singers and athelets do) and his primary motivation, as indeed of almost all politicians, is to gain power and control the world events (there are very few examples of the likes of George Washington who adamently refused from accepting the proposal of becomming the elected king of the United States, how ironic that today's George Bush is practically an elected king with all the powers of imperial presidency in his grasp). And, while his personal motivations arise from the Me & It quadrant, he genuinley believes that his rise to power is something that is good for the people--i.e. he and a lot of politicians like him actually beleive that they are serving the people, not ruling them--this implies that his general outlook on life is positivist/legalist, which places his metaphysical view in the Me & We quadrant. On the otherhand, a spiritual/political leader such as Gandhi operates from the We & It quadrant, and his metaphysical views too, although not stricly Hegelian, emerge from that quadrant. In contrast, the views of Nietzsche would be entirely in Me & It, inspite the fact that existentialism (a Me & We ontology) gains much inspiration out of him. The point is that all these three forms of "flatlands" are the result of a fractured reality within a rational/form-op mind of an adult modern human--there is no hierarchy between them. And the last stage (my addition to Piaget's four stages) the "trans-formal operational" is not a higher stage but merely a systematic/philosophic perspective. It is not a higher stage in psychic development because all humans, at form-op level, ought to be able to appreciate trans-form-op, the fact that they do not is simply due to their inertia and naivty--like blind men touching different parts of the elephant and describing it differently. 2. Transrational is not post-rational but a systematic way of using reason. [This is not how Wilber uses the terms; for him transrational and transpersonal are interchangeable]. Although it was once thought that neurons fused after a certain age, recent studies have shown that this is not necessarily the case provided the mind remains active. This is an area where meditation can play an important role. So even though development is considerably slowed (and in some cases stops or even reverses) after the age of 21 it's still possible to move ahead developmentally. This is like the fallacious argument of Marx that stated that given the history's dialectical march towards progress, the first country to socialize/communize itself would be Germany (the most technologically advanced capitalist economy of Europe) and the last would be Russia. I'm not so sure that Marx was wrong. At least not yet... But that's a different conversation. Existentialism is about as far from the mythical mindset as one can get. Both are based upon an “occasionalist” a-causal view of reality. The mythic mindset in it's most extreme form is absolutistic which is the direct opposite of a-causality. —and it is no surprise that existentialist (and its derivative ideologies), of the likes of Kierkegaard (a Christian) or Sartre (an atheist), profess extreme moral relativism and ontological skepticism on rational grounds. Yes, that's because they were early post-modernists which is roughly the equivalent to Loevinger's "Individualist stage or the transition between Orange and Green in SD. The Individualist stage or Stage 4/5 describes what a person can “see” with a fourth person perspective. People now realize that things are not necessarily what they seemed at earlier stages because the interpretation of reality always depends on the position of the observer. Thus the idea of the participant observer, the observer who influences what he observes, is now becoming a conscious preoccupation. One can never be as totally detached and “objective” as the rational/scientific outlook of the Conscientious stage would have it. The same object/event can have different meanings for different observers, for the same observer in different contexts or at different times. Individuals become interested in watching themselves trying to make sense of themselves. This constitutes an important change in thought mode. Individualists abandon purely rational analysis in favor of a more holistic, organismic approach in which feelings and context are taken into account and the process becomes as intriguing as the product or outcome. Individualists also favor more relativistic or psycho-logical approaches over merely logical ones. The need to explain everything is gone, and head trips are less appealing. Individualists distrust conventional wisdom and the hyper-rational tenets of the Conscientious stage. They need to distance themselves from all that went before. In this case, one must reevaluate the self-adopted, yet sanctioned role identities of society and redefine oneself uniquely and independently of them based on one’s own experience and conclusions. mental freedom such a maneuver allows. 1. AQAL requires methodological Individualism (or what I call systemic subjectivism) if it truly wants to produce a choice that is simply not in the “We & It” flatland. Methodological Individualism is handled in the upper left hand quadrant in AQAL. Or more accurately it's located in zone #2. Hegel's approach was zone #1. Just one more note. The difference between I, me, and mine is developmental. They're all upper left quadrant just at different levels of development. Actually, as you can see from the above, the proper place for mysticism is within the subjective; however, the reason I've labelled a whole quandrant of We & It (corresponding to Wilber's social/plural-exterior) as mystical, is because of the objective pronouncements about the nature of reality based upon holistic premises--as done by Plotinus, Hegel, and Marx in the West, and by the whole lot of Indian yogis and rishis--that Wilber calls mysticism, and is also know by the name of Absolute Idealism, Dialectical Materialism, or Integral Yoga. My interior/exterior divide of mythic/mystic is based upon Campbell's understanding of mythic-mysticism. I'm afraid that this is what Wilber would call a pre/trans fallacy. However, as I've pointed out, there is a difference in what I have to say about it, which is not based upon the notions of Freud (reduction of all transpersonal to prepersonal) or Jung (elevation of all prepersonal mythology to transpersonal mysticism). My understanding of myths and mystery is based upon the view that while these two states are not exactly the same in their outward manifestaion, yet they are based upon the same premise, so to speak. In my notes I had labelled the quadrants as egoist, nihilist, and altruist, but in replying to your post I chose to labell them as magical, mythical, and mystical. I'd also like to point out that I disagree with the suggestion that after the age of 21, the human cognitive development is still linear and hierarchic, albeit, the transitions are gradual and thus not noticible. In my opinion, there is not internal logic to what mature adult humans believe; that is, there is no observational data to support that all adult humans would go through a similar phase of cognitive developement after reaching the age of majority (18-21). And since the trend is not universal, I see no reason to consider the advanced stages as vertical hierarchic. And as I said, they are a horizontal non-sequential flatland rationality. The only genuine advancement from that is a systematic understanding of being, beginning with the subject. These stages aren't about what people believe but how people believe. And in Wilber's model the quadrants exist at a levels. It's just that they are recognized or taken into account at all levels. ...that is, there is no observational data to support that all adult humans would go through a similar phase of cognitive developement after reaching the age of majority (18-21). And since the trend is not universal, I see no reason to consider the advanced stages as vertical hierarchic. The trend is not universal for those under the age of 18 either. There are some people out there that stop developing in their early teen years while others continue to develop into old age. It's similar to athletic development. In most cases men continue to develop athletically into their early twenties and then plateau and slowly decline in their thirties. That's not always the case however. In some cases people peak in their teen years and in other cases (as with Barry Bonds for instance) they continue to develop into their forties. Looking at the SCT - have there been any studies done with it recently? Any plans to update it? It's just that it drips with sexism and rigid gender roles, which makes me really really really glad that I wasn't born until 1980. I mean, really? "A woman should always...."? A woman should always object to being told that she has to always do something based on nothing other than the fact that she has two X chromosomes. It's just that I would like to see what the percentages of people at the various levels are now, not back in the day when apparently everyone was a raging misogynist. There are no right or wrong answers to the sentence completion test. People of, or below, a certain level of ego development are more likely to see things like gender roles in more concrete terms. Such questions are intended to flush these various levels out. If you are at a "Self-Aware" or higher level of development it makes sense that you might find questions stated, "A woman should always....", perhaps a bit sexist. Someone at a lower level of development would probably answer that question a lot differently than you would. The survey above is fairly recent BTW (within the last ten years). Susan Cook-Greuter still uses Loevinger's sentence completion test as is. I took one for her a few years ago. A classic example of the "Conformist" level of ego development. Subject: Re: "Loevinger's Stages of Ego Development"